In the left-hand navigation bar, you will see a pull-down menu titled "Collection Selector" that can be used to access collection specific administration screens. 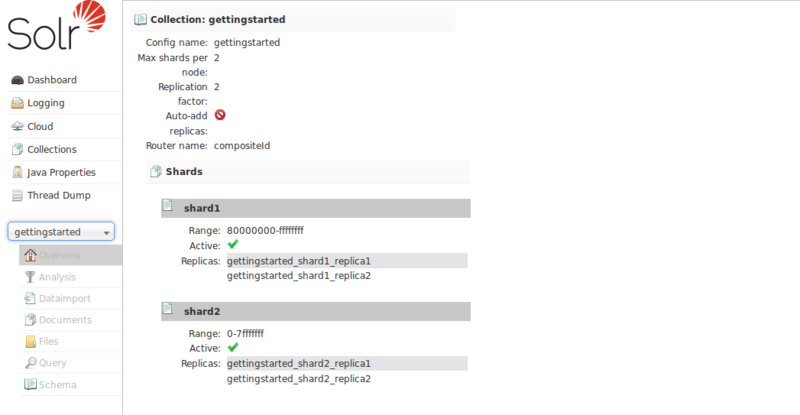 The "Collection Selector" pull-down menu is only available on Solr instances running in SolrCloud mode. Single node or master/slave replication instances of Solr will not display this menu, instead the Collection specific UI pages described in this section will be available in the Core Selector pull-down menu. Clicking on the Collection Selector pull-down menu will show a list of the collections in your Solr cluster, with a search box that can be used to find a specific collection by name. When you select a collection from the pull-down, the main display of the page will display some basic metadata about the collection, and a secondary menu will appear in the left nav with links to additional collection specific administration screens. Analysis - lets you analyze the data found in specific fields. Dataimport - shows you information about the current status of the Data Import Handler. Documents - provides a simple form allowing you to execute various Solr indexing commands directly from the browser. Files - shows the current core configuration files such as solrconfig.xml. Query - lets you submit a structured query about various elements of a core. Stream - allows you to submit streaming expressions and see results and parsing explanations. Schema Browser - displays schema data in a browser window. We welcome feedback on Solr documentation. However, we cannot provide application support via comments. If you need help, please send a message to the Solr User mailing list.